A Roc Book (Penguin), 2014. 414 pages. This was the first book I read in 2015, and I will not be one bit surprised if it ends up being my favorite book read in 2015. I already loved Juliet Marillier’s writing. This book starts a new series completely unlike her others – but equally rich, moving, and filled with magic. 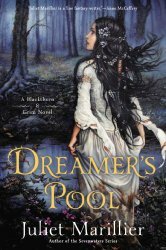 The subtitle calls Dreamer’s Pool A Blackthorn & Grim Novel. At the start of the book Blackthorn and Grim are in a wretched prison. The book begins with Blackthorn hoping for release. However, much to her surprise, the next morning just before dawn, she is instead later brought to meet with a fey nobleman named Conmael. He makes her an offer -- with conditions. "I'm offering you a chance to be safely out of here before they come for you. You'd leave the district and travel north to Dalriada. There'd be help along the way, and a place to stay when you got there. After that, you'd need to earn a living doing what you did before. There's always a need for skilled healers." As I made to speak again, to say I couldn't go anywhere because I had to appear at the council, Conmael gestured me to be quiet. "There are three conditions you must agree to meet before I grant you this opportunity. Firstly, the considerable skill you possess must be used only for good. You will not let bitterness or anger draw you down the darker ways of your craft. Secondly, if anyone asks for your help, you will give it willingly. I do not mean solely those who come to you for assistance with their ailments, but anyone at all who seeks your aid." "And thirdly?" It occurred to me that I could be as good a liar as anyone. What was to stop me from agreeing now, and once I was out of here, doing whatever I pleased? I might yet live beyond dawn and see Mathuin brought down before nightfall. My heart began to race. "Thirdly, you will not seek vengeance. You will remain in Dalriada and stay away from Mathuin of Laois." That, I could not do. But I bit back the no that sprang to my lips. "Is there a period of time attached to this ridiculous proposition?" Conmael gave a cool smile. "Seven years," he said. "That is the term for all three conditions." "What?" Morrigan's curse, I'd be lucky if I managed seven days, let alone seven years! Walk away and leave Mathuin behind me, his crimes not only unpunished but not even reported? Agree to every single request for help? As for using my gifts for good, all the good had been beaten out of me long ago. My spirit was as stained and foul as my reeking, vermin-ridden body. But then, what did it matter if I was bound to his stupid plan for my whole life, provided I saw Mathuin brought to justice first? "Mathuin has done ill deeds," Conmael said. "He's also a powerful chieftain who enjoys the support of many fellow leaders. You are a prisoner, without family, without resources, with no home to go to and no friends to help you. Even if you did stand up at the council, even if you did make these accusations before the assembled chieftains, who would take your word against Mathuin's? All you would achieve is your own destruction. So let us set a limit on the number of times you may break the rules. Five, I think." "Or you find yourself back here, filthy, worn down, defeated, with the executioner knocking on your door. And this time, no reprieve." Conmael does rescue her from prison -- by blowing apart the prison. The only survivors are Blackthorn and Grim. Blackthorn would have gone to Dalriada on her own, but when Grim asks to help her, he asks in a way that makes her realize she'd be helping him to allow him to stay with her. Because of Conmael's conditions, she can't say no. That's one complex story thread of this book. And we also hear Grim's perspective on events. But a third narrator, Prince Oram, also gives us his story. Oram is the prince ruling Dalriada, where Blackthorn and Grim are now living. He has found the love of his life via exchange of letters. But when his betrothed comes to visit, to seal the betrothal, she bathes and almost drowns in Dreamer's Pool, near Blackthorn's cottage. And after that, something is very wrong. Even her beloved dog wants nothing to do with her. This is about Blackthorn and Grim starting new lives, dealing with shadows of the past, and helping people by solving mysteries. There is also a young girl who has suddenly gone missing. The people of the village think she ran off with a gypsy, but the girl's friend thinks otherwise, and Blackthorn is good at listening. I can't communicate all the beauty that is in this book. Blackthorn is dealing with deep scars and pain, but the author makes you care deeply about her and the new life she is setting up. Grim is big and strong, and has a reputation for not being very bright, but we come to love him, and even Blackthorn comes to realize she can't do without him. There are mysteries in this book, natural and supernatural. And characters you will come to love. My favorite thing about the book? There's going to be more about Blackthorn and Grim.